multilingual world – anywhere, anytime! We have an extensive team of certified professional interpreters who can interpret more than 100 languages. We are careful in matching the strengths of our interpreters to each job and assignment. It also means that we have a professional interpreter for every combination of languages; and a skilled interpreter for different fields with excellent command over specialized terminologies. Is that what you were looking for? 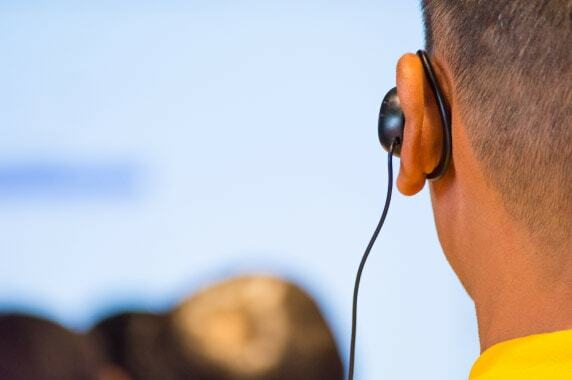 In our interpreting services, we make sure that multilingual conference interpreting is done by real experts and professionals that have proper command over languages being used and skills required to correctly comprehend the message and translate it for the target language listeners in an accurate way. Even if this means that the interpreter has to work fast. Or under pressure! Our interpreting services team consists of key professionals who are certified in multilanguage conference interpretation with international experience so that you get only the best quality language interpretation services. We also have extensive cultural knowledge that guarantees correct communication and render them to be valuable cultural liaisons between multi language speaking audiences – who are crucial for your business. We understand different dialects and variations of languages so that the message is interpreted as the source intended it to be received. Simultaneous interpreting: We offer interpretation for large conferences and meetings where two or more languages are required. It is a highly skilled task that requires an interpreter to have years of subject-matter expertise and experience in language interpretation services. Usually interpreters are in an isolated booth, listen to the speaker through a headset and then speak translation into a microphone that wirelessly transmits to headsets worn by the audience. We have the trained interpreters and special equipment to do this successfully. Consecutive interpreting: This interpretation is commonly used in small or one-on-one group settings where the speaker delivers a complete note and lets the interpreter deliver the same note in the translated language right after. Since the interpreter has to listen to and remember a large amount of translation, it is important for him to have exceptional linguistic and interpersonal skills. This type of interpretation is usually done in workshops, court hearings, medical and legal appointments, business meetings, interviews and press conferences. Face to Face Interpreting: Our interpreter will be physically present at the appointment and will translate the message from one language into another. This approach works best in situations such as medical appointments and confidential meetings or even international conferences. A wired microphone system comes with built-in language channel listening for participants, is given to everybody in the conference room. For presenters, wireless microphones are installed by technicians before the conference. This has many options such as custom-built, full size soundproof booths are installed at the back of the conference room. If there is less spaces, we can install a compact table-top booth. These are used in less formal settings. The portable equipment system is economical. A small transmitter is used for the interpreter and wireless receivers with headsets used by listeners – allowing movement. This type of equipment can be used for small group meetings, tours, visits or in lectures, presentation and in classrooms too. We can suggest a suitable type of interpreting equipment according to the situation in which the interpretation is required. We are very well aware of the importance that accurate and correct interpretations hold for your business in multiple situations. We could help you remove all language barriers that could slow down your progress or become a hurdle in your business.